Precious white knit gown by Paty, Inc. perfect for your little boy for anytime of the year but especially lovely during the Christmas season. 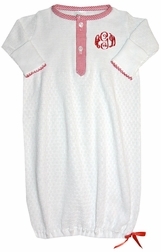 The front is made with a red gingham button placard and red gingham trim around the neck. The sleeves are finished with red tatting. Monogram the left chest for a little more color and sophistication.